Subscribe to the KrisFlyer Spree eNewsletter. Log in to www.krisflyerspree.com and click on “My Account” followed by “eNewsletter Subscription” to subscribe to the eNewsletter. 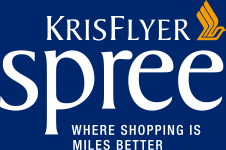 A promo code will be sent to all subscribers on 10 April 2019 via the KrisFlyer Spree eNewsletter, which can then be applied to all purchases made from 10 to 23 April 2019. Emails will be sent to the registered email address on the member’s KrisFlyer account at the time of subscription. Key in the promo code for every purchase via KrisFlyer Spree. Once the promo code is applied, a new earn rate with 20% bonus* miles will be displayed and applied to the current purchase. *The Promo Code needs to be applied to every purchase to enjoy 20% bonus KrisFlyer miles on all purchases made from 10 to 23 April 2019. All KrisFlyer Spree eNewsletter subscribers who sign up by 31 March 2019 will be eligible to earn 20% bonus KrisFlyer miles on all their transactions made via KrisFlyer Spree from 10 to 23 April 2019. KrisFlyer members must be logged in on www.krisflyerspree.com to subscribe to the KrisFlyer Spree eNewsletter. Subscribers will need to apply the promo code to earn the 20% bonus KrisFlyer miles. This promotion is available to all subscribers who subscribe before 1 April 2019. All subscribers will receive the 20% bonus miles promo code via the KrisFlyer Spree eNewsletter on 10 April. Instructions on how to apply the promo code will be included. The promo code is valid for purchases made via KrisFlyer Spree from 10 to 23 April 2019. Claims for missing KrisFlyer miles will not be eligible for the 20% bonus KrisFlyer miles. The promo code can only be used by eligible subscribers who are logged in on www.krisflyerspree.com. KrisFlyer miles earned on all tracked purchases made from 10 to 23 April 2019 will be calculated based on the bonus KrisFlyer miles earn rate. Purchases will be validated and approved as per KrisFlyer Spree’s standard terms and conditions. Click here to find out more. Individual merchant terms and conditions apply. Merchants and Singapore Airlines reserve the right to amend the terms and conditions at their sole discretion.